On 18 June the two armies at Waterloo faced each other on two low ridges that were separated by a gentle valley, which was bisected by the Charleroi to Brussels road. The frontage was about 5,000 yards and the battlefield measured no more than three square miles. The small hamlet of La Belle Alliance was on the road in the centre of the French line. In front of the Allied line were the Château of Hougoumont on their right, the farm of La Haye Sainte on the road in the centre and the town of Papelotte on the left. Wellington had 53,850 infantry, 13,350 cavalry, 5,000 artillerymen with 157 guns and 1,000 others (staff, engineers, medical, supply etc) for a total of 73,200 troops. Only 36 per cent of them were British, with 13 per cent Dutch and 9 per cent Belgian: Belgium was then part of the Kingdom of the Netherlands. The other 45 per cent were Germans: 10 per cent were part of the King’s German Legion, Germans serving as part of the British Army; 17 per cent were from Hannover, whose King was also King George III of the United Kingdom; 10 per cent were from Brunswick; and 8 per cent from Nassau. A further 17,000 Allied troops had been positioned at Hal to cover an alternative road to Brussels; they did not take part in the battle. Napoleon’s army was only slightly bigger, except for a superiority in artillery: 53,400 infantry, 15,600 cavalry, 6,500 artillerymen with 246 guns and 2,000 others for a total of 77,500 men. He had sent 30,000 troops under the newly promoted Marshal Emmanuel de Grouchy to cover the Prussians at Wavre. Blücher had 100,000 men and 283 guns available for combat, but only 49,000 men, made up of 38,000 infantry, 7,000 cavalry, 2,500 artillerymen and 1,500 others, and 134 guns fought at Waterloo. General Honoré Charles Reille, the commander of II Corps and like Soult a Peninsular War veteran who had fought Wellington and the British many times, argued that the British firepower meant that the French should manoeuvre rather than launch a frontal assault, but the Emperor dismissed this. He decided to postpone the attack from the original 9 am start in order to allow the wet ground to dry, which would aid manoeuvre and allow artillery rounds to ricochet off the ground. The army was also behind its timetable. The Emperor would not have delayed in the past, having once said that ‘space we can recover, but time, never. The delay meant that the Prussians were getting closer to Waterloo. General August von Gneisenau, Blücher’s chief of staff, wanted to keep the majority of the Prussian army at Wavre until at least noon, but Blücher insisted that two corps should head to Waterloo immediately. General Friedrich von Bülow’s IV Corps, which had not been at Ligny, had set off at daybreak. The artillery bombardment began about 11:30 am. Grouchy heard it, but declined the advice of General Étienne Gérard to march to the sound of the guns. Had he done so he would have intercepted Bülow before the Prussians reached Waterloo. As the artillery opened fire the French 6th Infantry Division, commanded by Napoleon’s brother Jérôme, attacked Hougoumont. This was supposed to be a diversion, but Jérôme was determined to take the objective, regardless of losses. He called up another division, meaning that much of Reille’s II Corps spent most of the battle fighting a single brigade. By 3 pm the French had sent 12,500 men of the 6th and 9th Divisions against 2,500 men of the 2nd Battalion, Coldstream Guards, 2nd Battalion, 3rd (Scots) Guards and 1st Battalion, 2nd Nassau Regiment. Light companies of Hannoverians and the 2nd and 3rd Battalions 1st Foot Guards also took part in the desperate and successful defence. The key event came at 12:30 pm, when Lieutenant Colonel James McDonnell ordered the closing of the North Gate, which had been left open to facilitate the movement of Allied troops. About 30 French troops, led by the axe wielding Sous-Lieutenant Legros, nicknamed L’enfonceur, got inside before McDonnell’s guardsmen shut and barricaded the door. Legros and his men were killed, except for a drummer boy. At 1 pm the Comte D’Erlon’s I Corps was ready to attack when Bülow’s 30,000 men were spotted approaching the French right flank. Napoleon ordered cavalry and the 10,000 infantrymen of Comte Lobau’s VI Corps to take up a defensive position facing them. D’Erlon’s attack began at 1:30 pm. For some reason he adopted an outdated and inflexible formation that meant that heavier casualties were suffered in the advance and that it was harder to deploy once in musket range. The attack also lacked adequate cavalry support. Papelotte was taken and the French almost reached the crest of the ridge. Sir Thomas Picton’s division then advanced to the crest and opened fire from 40 yards before charging and forcing the French back. Picton was amongst the dead. Two British heavy cavalry brigades, the Household and Union Brigades, then charged D’Erlon’s corps, sweeping them away, inflicting 4,000 casualties and capturing two eagles. The Allied cavalry commander, the Earl of Uxbridge, led them personally. However, the British cavalry carried on instead of stopping to reform and were themselves charged by French cavalry. The British suffered 1,000 casualties and the 1,500 survivors were spent for the rest of the battle. Around 3 pm the fighting died down everywhere except Hougoumont, enabling the Allies to reinforce La Haye Sainte and recapture Papelotte. At 3:30 pm Napoleon ordered Marshal Michel Ney to capture La Haye Sainte regardless of casualties. The first attack, by the only two brigades of D’Erlon’s corps that had rallied, failed. However, Ney mistook a column of Allied ambulances, empty ammunition wagons, wounded and a small number of cavalry heading towards Brussels for signs of a retreat. He launched a series of cavalry attacks, which the Allied infantry were able to beat off by forming square. By 5 pm Ney had committed almost 9,000 cavalry, 6,000 of them armoured cuirassiers or carabiniers. Between 5 pm and 6 pm another 4,500 cavalry attacked after a heavy preliminary bombardment. A total of 76 guns in 12 batteries either gave preliminary fire support or, in the case of horse artillery, accompanied the cavalry. The guns inflicted heavy casualties on the squares but none broke. The Allies had 14,000 infantry in 25 squares and 65 guns. None of the attacks were supported by infantry until 8,000 men from Reille’s II Corps attacked at 5:30 pm. By then the tired cavalry had withdrawn to regroup and Allied musket fire beat off the attack with 20 per cent casualties. David Chandler argues that if Napoleon had ‘sent forward the Imperial Guard (or even half of it), the battle would almost certainly had been won.’ However, he adds that the Emperor had good reasons to reject Ney’s request: he did not know what state Wellington’s army was in; Ney’s performance so far in the battle had done nothing to make Napoleon trust him; and the Emperor was also worried about his right flank. Bülow was threatening Napoleon’s right by 4 pm. He nearly turned back after hearing gunfire from Wavre, a town with two stone bridges across the River Dyle, where Grouchy had attacked the Prussians. However, Blücher insisted that Bülow continue. Grouchy won a tactical victory at Wavre, but it made no difference to the outcome of the campaign. 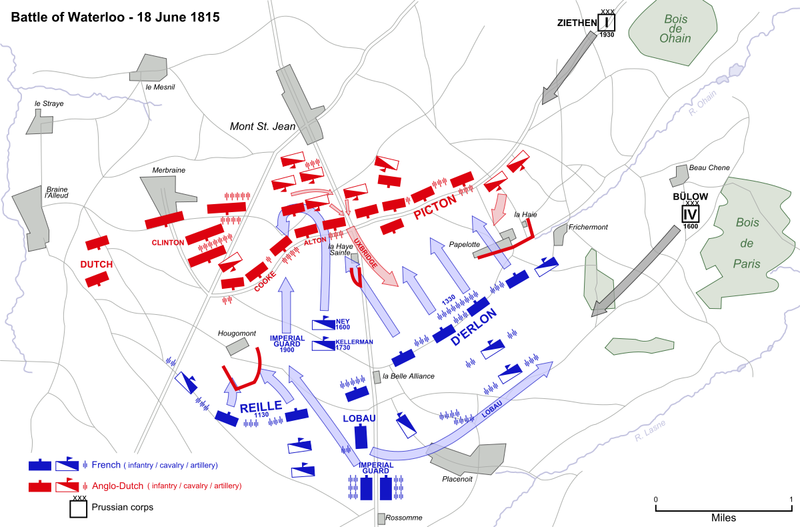 He briefly renewed his attack on 19 June, taking Wavre by 10 am. However, he heard the news from Waterloo half an hour later and withdrew. By 5 pm after an hour’s fighting Bülow had forced Lobau back to the village of Plancenoit, which the Prussians soon captured. Their artillery could now threaten Napoleon’s line of retreat, so he sent a division of the Young Guard in an attempt to retake it. The Young Guard recaptured Plancenoit, but was then thrown back. Napoleon prioritised the threat to his communications, putting 11 battalions in square on his right flank and sending two Old Guard battalions to retake Plancenoit. They succeeded, forcing 14 Prussian battalions to retreat, but then pushed on too far and had to fall back. However, Plancenoit was now occupied by the Young Guard and the right flank was stable by 6:45 pm, allowing several battalions to return to the reserve. They failed, but two battalions of the Old Guard then recaptured it, throwing back 14 Prussian battalions from the immediate area. Both sides then stopped to regroup, allowing Napoleon to bring some of the battalions that had been sent to his right back to his central reserve by 7 pm. The right flank was temporarily stabilised, but more Prussians were on their way. Napoleon therefore decided that now was the time to commit the Imperial Guard units from his central reserve against Wellington’s centre. He personally led them to within 600 yards of the enemy, before handing command over to Ney. The advance began at 7:30 pm with five battalions of the Middle Guard and a battery of horse artillery in the first line and three battalions of the Old Guard in the second line. Another Middle Guard battalion was positioned as a reserve about half way between Hougoumont and La Haye Sainte. The attack was intended to be a general one led by the Imperial Guard rather than one by the Guard alone. Some cuirassiers and Guard cavalry moved forward, but the main support from other units was from artillery. When the 1/3rd and 2/3rd Chasseurs à Pied, which had taken significant casualties from artillery fire, reached the crest they appeared to face no opposition. However, the 1,400 guardsmen of Major General Peregrine Maitland’s Brigade stood up 25 metres away when Wellington shouted ‘Now Maitland! Now’s your time!’, firing a volley that hit over 20 per cent of the surviving Chasseurs, with the others retreating. The British Guards charged the retreating French with fixed bayonets. The 4th Chasseurs then appeared. Maitland ordered his two battalions to stop and reform; the 2/1 Guards on the right did so, but the 3/1 misunderstood and formed square. The 4th Chasseurs continued, but then were confronted by the largest battalion in Wellington’s army, over 1,000 men of Colonel Sir John Colborne’s 52nd Foot. The two battalions briefly exchanged fire before the French retreated. Wellington now ordered a general advance. The discipline, courage and experience of the Old Guard allowed many, including Napoleon and his entourage, to escape. Waterloo was a joint victory for Blücher and Wellington. Napoleon planned to defeat Wellington’s multi-national army before Blücher’s Prussians arrived. He could have beaten either of the two Coalition armies but not both together. Wellington could not have won if Blücher had not arrived, but he would not have fought had he not been sure that Blücher was coming. Blücher could not have won had Wellington not stood and fought on ground of his own choosing. The French lost because they made many mistakes, most of which were the responsibility of Napoleon for appointing the wrong men to key jobs. Ney was unsuited to independent battlefield command, Soult had no experience of staff work and Grouchy none of infantry command. Napoleon did not supervise operations as closely as he had done previously. He would not in the past have wasted so much time in the morning, allowed so many troops to be sucked into the battle for Hougoumont or permitted Ney to make several uncoordinated attacks on Wellington’s squares. Better options for key positions would have been Marshal Louis-Gabriel Suchet, who was commanding the Army of the Alps, as Chief of Staff, Soult in Ney’s job and Grouchy commanding the cavalry. Marshal Louis-Nicholas Davout, Napoleon’s best Marshal, who was left in Paris as its Governor and Minister of War should have had Grouchy’s command. The table below gives the total casualties (dead, wounded and missing) over the campaign, including those in a Franco-Prussian engagement at Gilly on 15 June. Some men lightly wounded in the earlier battles fought at Waterloo and not every available man fought at Waterloo. Source: M. Adkin, The Waterloo Companion, (London: Aurum, 2001), pp. 73-74. All ranks suffered heavily on the three square mile battlefield of Waterloo. Six French generals were killed and 37 wounded out of 114 present. The Allies, who had relatively fewer generals, had five killed and 14 wounded out of 41 and the Prussians two killed and one wounded out of 26. The battle did not immediately end the war, as the French were holding on elsewhere, but the large numbers of Austrian and Russian troops approaching France meant that Napoleon had little chance of victory. He abdicated on 22 June, hoping to escape to the United States of America from the port of Rochefort, where a ship had been provided for him. On 3 July he arrived there to find that it was blockaded by the British. He surrendered to them on 15 July, hoping to be allowed to live in Britain, but was exiled to St Helena in the south Atlantic. Most of Napoleon’s senior commanders eventually regained their titles under the restored monarchy. The restored King Louis XVIII issued the Cambray Proclamation, which stated that those who had been ‘misled’ into following Napoleon would not be prosecuted but that he would not ‘pardon the instigators and authors of this horrible plot.’ Ney and the Comte de la Bédoyère, one of Napoleon’s aides, were tried and shot. This website notes that others named on King Louis XVIII’s ordinance, including D’Erlon and Grouchy escaped abroad, but Ney refused opportunities to do so. For a discussion of why Waterloo was important see this post by Dr Huw J. Davies in Defence in Depth, the blog of the Defence Studies Department of King’s College London. For a number of articles on the British Army in this period see the latest issue of the British Journal of Military History, a free academic journal: registration is required but not payment. The Napoleonic Wars of 1803-1815, which had closely followed on from the Revolutionary War were now over. It was also the last of a series of major European Wars that had begun with the Nine Years War of 1688-97. The opposing Coalitions had varied, but France and Britain were always on different sides. It was some time before the two became allies and British and Vichy French forces did fight during World War II, but Waterloo was the last major battle between the two countries. G. Wootten, Waterloo 1815: Birth of Modern Europe (London: Osprey, 1992), p. 47. D. Chandler, The Campaigns of Napoleon (London: Weidenfeld & Nicolson, 1966), p. 1064. M. Adkin, The Waterloo Companion (London: Aurum, 2001), p. 37. The first stage of Napoleon’s 1815 campaign was to concentrate the 123,000 men of his Armée du Nord just south of the junction of the Duke of Wellington’s 112,000 Anglo-Dutch Army and Prince Gerbhard von Blücher’s 130,000 Prussians. Napoleon’s plan was to position his army between his two enemies, preventing them uniting. He would then defeat one of them, making it retreat along its line of supply and leaving it unable to support its ally, which Napoleon could then turn on. The Emperor had an experienced army with high morale. but he made a number of ‘unsuitable appointments’ to high command. His long serving chief of staff, Marshal Louis-Alexandre Berthier, had fallen from a window to his death on 1 June: whether this was an accident, murder or suicide has never been resolved. However, Napoleon had already given this job to Marshal Jean-de-Dieu Soult, an experienced battlefield commander who had never held such a position. The best choice would have been Marshal Louis-Gabriel Suchet, who was instead commanding the Army of the Alps. Command of the left wing was given to Marshal Michel Ney, a very brave and inspiring leader, but unsuited to independent command. Emmanuel de Grouchy, a fine cavalry commander with little experience of infantry, was promoted to Marshal after the battle of Ligny on 16 June and put in command of the right wing. Marshal Louis-Nicholas Davout, Napoleon’s best Marshal, was left in Paris as its Governor and Minister of War. Davout on the right and Soult on the left were Napoleon’s best options for wing commanders. The Emperor also declined to employ Joachim Murat, King of Naples, the best cavalry commander of the Napoleonic Wars. He had good reasons to do so: Murat had defected to the enemy in 1814 and then attacked the Austrians in Italy too soon in 1815. His consequent rout at Tolentino on 2-3 May allowed the Austrians to redeploy troops from Italy to France. Grouchy would have been a good alternative, but Napoleon did not appoint an overall cavalry commander. Wellington’s army was a multi-national one, including Dutch and Belgians from the Netherlands army and a large number of Germans, including men from Brunswick, Hannover and Nassau, plus the King’s German Legion, who were Germans in British service. The quality of Wellington’s troops was mixed. Some were veterans, whilst others were inexperienced conscripts. Many of the veteran British troops and commanders had been sent to North America to fight in the War of 1812. Major-General John Lambert, who had taken over command at New Orleans after his superiors were killed or wounded, returned home in time to also fight at Waterloo, but many others were still in or on the way home from North America. The veteran Dutch-Belgians had obtained their experience fighting for Napoleon. One of Wellington’s corps commanders was the very experienced British General Sir Rowland Hill but the other was the very inexperienced 22 year old Prince of Orange. His second in command and cavalry commander was the Earl of Uxbridge. He was a much better cavalry general than Wellington had had for most of the Peninsular War, but their personal relations were poor, since Uxbridge had eloped with Wellington’s sister-in-law. The army did have good division commanders, both British and Germans who had gained their experience fighting against Napoleon and Dutch and Belgians who had fought for him. Over half of Blücher’s army consisted of Landwehr, who were inexperienced and poorly equipped but often highly patriotic. There were also a number of men from parts of Germany that only became Prussian in 1814, many of whom had fought for Napoleon until then. They included 14,000 Saxons and Silesians who mutinied and had to be disarmed before the campaign even began. 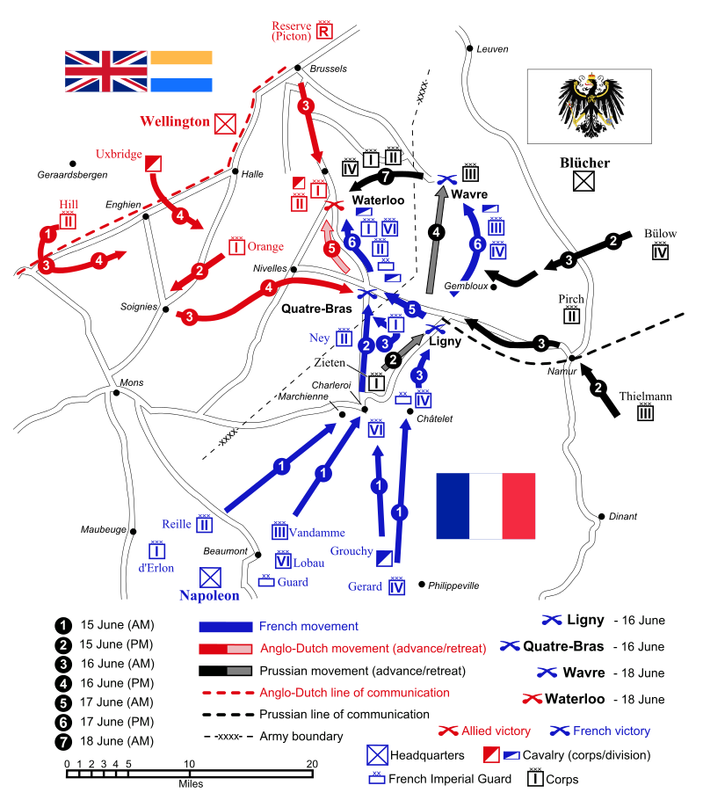 The French began to move at 2:30 am on 15 June, taking Blücher and ‘especially’ Wellington by surprise. The Duke and many of his senior officers were attending the Duchess of Richmond’s ball in Brussels on the evening of 15 June. About 2 pm on 15 June General Jean Victor de Constant Rebecque, the Prince of Orange’s chief of staff, authorised General Count Perponcher-Sedlnitzberg, commander of the 2nd Dutch-Belgian Division, to move Prince Bernhard of Saxe-Weimar’s brigade of Nassauers to the crossroads at Quatre-Bras, a vital junction on the road from Charleroi. Ney had sent 2,000 cavalrymen under General Charles Lefebvre-Desnouëttes to reconnoitre ahead of the main body of the left wing of the Armée du Nord. They encountered Bernhard’s advance guard, which retired on the rest of his brigade. However, Perponcher’s 8,000 infantry, 16 guns and 50 cavalry were faced by Ney’s 25,000 infantry, 3,000 cavalry and 60 guns, with 20,000 more French close behind and another French corps and the Imperial Guard expected. Reports of the French advance reached Wellington during the ball. He realised that a move by Napoleon towards Mons was a feint to draw his army west in order to protect its line of supply. He told the Duke of Richmond that Napoleon had ‘humbugged me…He has gained 24 hours’ march on me…I have ordered the army to concentrate at Quatre Bras; but we shall not stop him there, and if so, I must fight him here’, pointing to Waterloo on the map. Napoleon expected Wellington to fall back and had therefore planned to attack him before he could concentrate his army. He told Ney of this verbally, but the exhausted Emperor did not dictate his written orders until 6 am, four hours later than his usual practice. There was a further two hour delay before they left his HQ, and Ney did not receive his written orders until 10:30 am. They told him to ‘hold yourself in readiness for an immediate advance towards Brussels once the Reserve reaches you’ so he issued no orders until 11 am and did not attack until 2 pm, by when Wellington reinforcements were arriving. Wellington reached Quatre Bras at 9:30 am, saw that the French were cooking food and headed to Ligny to meet Blücher. The attack by General Honoré Charles Reille’s II Corps began at 2 pm. It was initially successful and had broken through the thin defensive line by 3 pm. However, Sir Thomas Picton’s 5th Division then arrived and stabilised the situation. Wootten notes that if ‘Reille had started just a short while earlier…the battle would now have been over almost before it had started.’ The arrival of Picton’s 8,000 men meant that 25,000 French troops were now facing 17,000 defenders. About 4 pm Ney received a message sent at 2 pm ordering him to attack and drive back whatever force he was facing, before turning to envelop Blücher. However, he did not realise that his sector was now the secondary one: Blücher’s forward disposition had made Napoleon to make the Prussians at Ligny rather than the Anglo-Dutch at Quatre Bras the main target. Ney sent an aide to hurry the advance of the 20,000 men of the Comte D’Erlon’s I Corps to Quatre Bras. However, the Comte de la Bedoyère, carrying orders to Ney to send I Corps against the Prussian flank encountered I Corps before he met Ney. De la Bedoyère sent it towards Ligny, but an error meant that it headed for the French rather the Prussian flank. Ney was furious when he discovered this; soon afterwards the appearance of another of Wellington’s divisions led him to send a message ordering I Corps back to Quatre Bras. It had nearly reached Ligny when the message arrived; it ended up fighting in neither battle. At 4:15 pm British squares beat off an attack by French lancers at the expense of heavy casualties. More reinforcements were arriving, giving Wellington 26,000 men and 42 guns. At 5 pm Ney ordered General François Étienne de Kellermann to attack with his heavy cavalry, although only one of his four brigades had arrived. The charge almost succeeded, catching two British infantry battalions in line, but it lacked infantry and light cavalry support and was thrown back by fire from a King’s German Legion gun battery and two British infantry battalions. By 6:30 pm Wellington had 36,000 men and 70 guns, outnumbering Ney. He counter-attacked and by 9 pm had regained almost all the ground lost earlier in the day. Total casualties (dead, wounded, captured and missing) were 4,100 French and 4,850 Coalition, 250 of the latter in the retreat the next day. 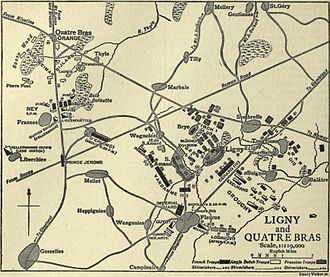 The main French attack, however, had been made against the Prussians at Ligny. The Prussian defence was based along the Ligny, a marshy stream that was hard to cross other than at its four bridges. A defensive line based on ten villages and hamlets covered them. The ground rose to the rear. However, the defensive line was vulnerable to flanking fire and troops on the forward slope could be bombarded by artillery. Napoleon intended to demonstrate with cavalry on the Prussian left whilst attacking their right and centre. When Ney appeared on their right the Guard would destroy the Prussian centre. The Prussians had 84,000 men, including 8,000 cavalry, and 224 guns to defend seven miles. Despite the favourable terrain, this was too few to defend that distance: 20,000 men per mile were then believed to be needed in defence. The Prussians hoped that a further 31,000 of their troops plus Wellington’s force would support them, but the former were too far away and the latter too heavily engaged. The French had 68,000 infantry, 12,500 cavalry and 210 guns, but could choose where to concentrate their attack and expected support from Ney. The attack began at 2:30 pm. Napoleon assumed that Ney had taken Quatre Bras and was heading for Ligny, since no gunfire had been heard from that direction. Grouchy’s cavalry on the French right pinned the Prussian left. A fierce battles for the Ligny stream and the villages beside it took place in the centre and on the Prussian right, French left. The Prussian reserve infantry was drawn up close enough to the line to be bombarded by French artillery, but too far away to use their muskets to support their front line. At 3:15 pm Napoleon sent an order telling Ney to envelop the Prussian right and rear. Almost immediately, he received news of Quatre Bras, so ordered that only D’Erlon’s I Corps should move to Ligny. Shortly afterwards, he realised that he had left the 10,000 men of the Comte de Lobau’s VI Corps near Charleroi without any orders, so ordered them to Ligny. By 5 pm Blücher had been forced to commit virtually all his reserves, but Napoleon still had 10,000 fresh troops. He intended to launch his Imperial Guard at 6 pm to strike the decisive blow, but about 20,000 men then appeared on the French left flank, causing the French troops there to waver. At first they were assumed to be hostile, but by 6:30 pm it was apparent that they were the French I Corps in the wrong place. D’Erlon had failed to follow the normal practice of sending officers ahead of his force. Napoleon ordered him to the correct place on the Prussian right flank, but by the time that the messenger arrived I Corps was on its way back to Quatre Bras. Blücher now led personally a counter attack by six battalions, which briefly retook the village of St Amand, but the French rallied and recaptured it. The Guard finally attacked at 7:30 pm in heavy rain. The infantry was supported by 60 guns on their right and heavy cavalry. Blücher then led another counter attack, this time by 32 squadrons of cavalry. It was repulsed and his horse was killed. French cavalry rode over him without recognising him, and he was eventually rescued by an aide. The Prussian centre had been crushed, but both wings were able to withdraw under cover of darkness. Total dead, wounded, missing and captured at Ligny were 13,700 French and 18,800 Prussians, with another 120 French and 10,000 Prussians being lost in the retreat the next day. Napoleon had defeated Blücher at Ligny, but the Prussians had escaped to fight again. Wellington and Ney had drawn at Quatre Bras, but the Anglo-Dutch army was forced to retreat because of the result of Ligny. If D’Erlon’s corps had fought at either battle, it would have been a decisive French victory. If Reille had attacked earlier, Ney could have won Quatre Bras soon enough to arrive on Blücher’s flank and make Ligny a decisive victory. These mistakes were Napoleon’s fault for making the wrong appointments. M. Adkin, The Waterloo Companion (London: Aurum, 2001), p. 29. G. Wootten, Waterloo 1815: Birth of Modern Europe (London: Osprey, 1992), p. 29. D. Chandler, The Campaigns of Napoleon (London: Weidenfeld & Nicolson, 1966), p. 1023. The last three paragraphs are based on Ibid., pp. 1021-22. The last three paragraphs are based on Ibid., pp. 1030-32. The Fall of Paris 30-31 March 1814 and Napoleon’s Abdication. Napoleon retreated to St Dizier after being defeated by Prince Karl Phillip zu Schwarzenberg’s Army of Bohemia at Arcis-sur-Aube on 20-21 March 1814. After some prevarication the Coalition decided that Schwarzenberg’s army and Prince Gebhardt von Blücher’s Army of Silesia should advance on Paris. Captured dispatches revealed that Napoleon intended to threaten the Coalition lines of supply back to the Rhine. They also indicated that the morale of the French army and it commanders was low, and that the Paris police chief feared that its population might not stay loyal to Napoleon if the enemy approached the capital. General Ferdinand von Winzengerode was ordered to pursue Napoleon with 8,000 cavalry. He was to trick the Emperor into thinking that both Coalition armies were following him, and to make sure that the Coalition command knew where Napoleon was. The Army of Bohemia defeated the French corps of Marshals Auguste de Marmont and Édouard Mortier at La Fère Champenoise on 25 March, leaving the road to Paris open. Napoleon’s only chance of holding his capital was to return to it. Dominic Lieven argues that he would have been ‘likely to galvanise and coordinate the defence, and overawe potential traitors in the city’ even if he had rushed there on his own, without bringing reinforcements to the garrison. Winzengerode was defeated by Napoleon on 26 March, losing 1,500 men and 9 guns. However, Napoleon did not learn of La Fère Champenoise and the threat to Paris until the next day. He began to force march his army towards Paris, but it was too late to get there in time. Napoleon’s Empress Marie-Louise and their son, the King of Rome, left Paris on 29 March. They were followed by Napoleon’s brother Joseph and much of the government the next day. By the evening on 29 March the Coalition had 107,000 men outside Paris. Marmont had 12,000 regulars and Mortier 11,000, but many of the 19,000 strong garrison were poorly trained National Guardsmen. Many of the Coalition troops were not ready to attack in the morning, but General Nikolai Raevsky’s Russian corps beat Marmont’s corps to the village of Romainville in the morning and also took Pantin. They held these against French counter attacks, but the Coalition were unable to make further progress until 3 pm, when all their corps were in position. The French were forced back to Montmartre and Marmont requested an armistice, which was agreed at 2 am on 31 March. The Coalition had suffered 8,000 casualties in taking Paris. Napoleon had force marched his army as far as Troyes by 30 March, but it was too exhausted to continue further. He pressed on, initially with just two cavalry squadrons, and then with only five officers in light carriages. Early on 31 March he learnt of the surrender of Paris, and returned to Fontainebleau. The Emperor had 36,000 troops with him on 1 April, rising to 60,000 two days later. He wanted to fight on, but the Coalition had 145,000 men in Paris, making his position impossible. The Coalition, which had previously offered to allow Napoleon to keep his throne if he accepted France’s 1792 frontiers, had not yet decided whether or not to restore the Bourbons. Their main objective was to install a regime that would be accepted by the French population and would ensure peace. One possibility was a regency for Napoleon’s infant son, but this was risky whilst Napoleon was alive. On 1 April the Coalition announced that it would not deal with him or any of his family. The next day the French Senate, ‘stage-managed’ by Charles-Maurice de Talleyrand, Napoleon’s former foreign minister, deposed Napoleon and invited King Louis XVIII to return to France. Napoleon, informed by his Marshals that he had no choice, abdicated on 4 April, initially in favour of his son. The Coalition refused to accept this, and he renounced the throne for himself and his heirs two days later. On 16 April the Treaty of Fontainebleau was ratified. Napoleon retained his title of Emperor with sovereignty over the island of Elba, a pension of two million francs per annum and a 600 man guard. He departed for Elba on 28 April. As a general Napoleon fought a very skilful military campaign in 1814, but as a statesman he left himself with an impossible task. He rejected several offers of terms that were far better than he could have obtained by fighting on as he was unwilling to accept a peace that he had not won on the battlefield. France was exhausted and outnumbered, making the outcome of the campaign a foregone conclusion. Napoleon was not strong enough to win a decisive victory and could not have afforded a major defeat. He was beaten in the campaign even without one. D. C. B. Lieven, Russia against Napoleon: The Battle for Europe, 1807 to 1814 (London: Penguin, 2010), pp. 518-19. F. L. Petre, Napoleon at Bay 1814 (London: John Lane, The Bodley Head, 1914), p. 195. D. Chandler, The Campaigns of Napoleon (London: Weidenfeld & Nicolson, 1966), p. 1001. C. J. Esdaile, Napoleon’s Wars: An International History, 1803-1815 (London: Allen Lane, 2007), p. 528. The Battle of La Fère Champenoise 25 March 1814. Prince Karl Phillip zu Schwarzenberg’s Army of Bohemia defeated Napoleon’s army at Arcis-sur-Aube on 20-21 March 1814, but did not immediately pursue the retreating enemy. Napoleon reached St Dizier on 23 March. On 22 March a patrol of Cossacks from Prince Gebhardt von Blücher’s Army of Silesia captured a French courier who was carrying a letter from Napoleon to his Empress, Marie-Louise. It revealed that the Emperor planned to attack Schwarzenberg’s communications in order to draw the enemy away from Paris. Blücher sent a copy of the captured letter to the main Coalition headquarters with the Army of Bohemia. A conference between Schwarzenberg, Tsar Alexander, King Friedrich Wilhelm of Prussia and their staffs on 23 March decided that the two Coalition armies should unite and pursue Napoleon. The Coalition commanders then received further captured dispatches. They showed that the morale of the French army and it commanders was low, and that the Paris police chief feared that its population might not stay loyal to Napoleon if the enemy approached the capital. These convinced Alexander that the Coalition armies should advance on Paris. On 24 March the Tsar persuaded Friedrich Wilhelm and Schwarzenberg that this was the right thing to do. Moving to a rich region that it yet to see fighting would make it far easier to supply the Coalition armies than would be the case if they followed Napoleon through an area that had already been ravaged by war. Paris was far more important politically to Napoleon than Berlin, Vienna or Moscow were to his enemies. The Coalition cavalry advance guard under General Pyotr Pahlen and the Crown Prince of Württemberg encountered the corps of Marshal Auguste de Marmont and Édouard Mortier at La Fère Champenoise at about 8 am on 25 March. Initially 5,700 Coalition cavalry and 36 guns, later reinforced by 2,500 more Austrian cavalry, faced 12,300 French infantry, 4.350 cavalry and 68 guns. The French cavalry were driven off the field and two light infantry regiments were forced to surrender. Marmont and Mortier could see that there were large numbers of enemy troops advancing on them, so retreated the rest of their troops in good order until about 2 pm. The Russian heavy cavalry of General Nikolai Preradovich’s 1st Cuirassier Division then arrived, bringing the Coalition force up to 12,000 men, and a heavy rain and hail storm started. With rain and hail blowing into their faces, the French infantry were unable to fire their muskets. Two squares gave way under fire from Russian horse artillery, and many of the French infantry panicked and ran. At the same time the sounds of another battle behind the Coalition cavalry could be heard. Neither side knew what this meant. Was it Napoleon marching to the rescue of Marmont and Mortier? In fat two French National Guard divisions, escorting a large convoy of guns and supply wagons, were being attacked by two cavalry divisions from the Army of Silesia. The 5,000 inexperienced French troops, commanded by Generals Michel-Marie Pacthod and François-Pierre-Joseph Amey, fought gallantly against Baron Korff and General Ilarion Vasilchikov’s 4,000 cavalry and three horse artillery batteries. They had to abandon their supply wagons as they retreated in square. Eventually their retreat brought them into contact with the main Coalition cavalry force. Most of the Frenchmen were killed or forced to surrender. The National Guardsmen fought very bravely, but the French suffered very heavy losses at La Fère Champenoise. Dominic Lieven estimates that they lost half of 23,000 men and almost all their guns in a fight with 16,000 Coalition cavalry. F. Loraine Petre says that the French lost over 10,000 men killed, wounded and captured and 60 guns against 2,000 Coalition casualties. Unless otherwise stated troop strengths are from D. C. B. Lieven, Russia against Napoleon: The Battle for Europe, 1807 to 1814 (London: Penguin, 2010), pp. 509-11. F. L. Petre, Napoleon at Bay 1814 (London: John Lane, The Bodley Head, 1914), p. 192. 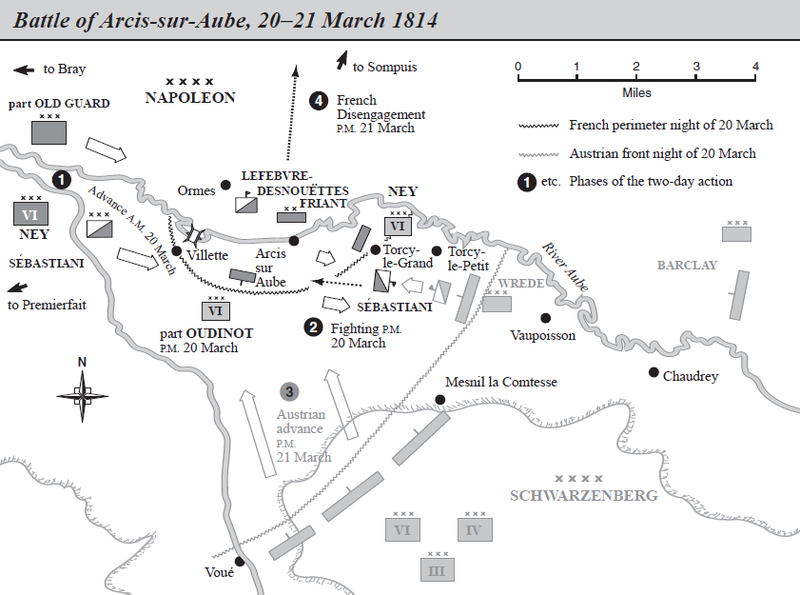 The Battle of Arcis-sur-Aube 20-21 March 1814. Napoleon’s victory at Rheims on 13 March 1814 put his army in between Prince Gebhardt von Blücher’s Army of Silesia and Prince Karl Phillip zu Schwarzenberg’s Army of Bohemia. The Army of Silesia, temporarily commanded by General August von Gneisenau because Blücher was ill, retreated to Laon, where it had defeated Napoleon on 9-10 March. This gave Napoleon an opportunity to move south with 24,000 men, including 4,500 recently arrived reinforcements, in an attempt to stop Schwarzenberg’s 122,000 troops advancing on Paris. He left 21,000 men under Marshals Auguste de Marmont and Édouard Mortier to cover the 100,000 strong Army of Bohemia. Marshal Jacques Macdonald, with 42,000 troops, had been ordered to hold back the Army of Bohemia, However, his force had been forced to retreat, and was reduced to 30,000 men by 17 March. The French advance began on 17 March. Napoleon now had a bridging train, enabling his army to move faster than it had been able to earlier in this campaign. However, Schwarzenberg, after learning of the Coalition defeat at Rheims, began to retreat to Troyes on the same day. Macdonald was unable to prevent him doing so. Napoleon decided to advance on Arcis-sur-Aube, which he thought was held only by a small rearguard. From past experience he thought that defeating it would result in Schwarzenberg retreating. However, the Austrian had decided to take the offensive. At 2 pm Schwarzenberg launched a major attack. Coalition cavalry at first forced back General Horace-François-Bastien Sébastiani’s outnumbered French cavalry, despite the support of Marshal Michel Ney’s corps. However, Napoleon put himself at the head of some newly arrived Old Guardsmen and rallied the cavalry. He frequently exposed himself to enemy fire in this campaign. At one point he deliberately rode his horse over an enemy howitzer shell just before it exploded. The horse was killed, but the Emperor was unharmed. After dark Sébastiani, with the addition of 2,000 recently arrived French cavalry, commanded by General Charles Lefebvre-Desnouëttes, launched a charge that routed two Coalition cavalry divisions. Their advance was halted by Russian artillery, but they retreated in good order. The French held the field after the first day and lost fewer men than the over 2,000 casualties that they had inflicted on the enemy. Napoleon still believed that he had fought the enemy rearguard, which had just been bigger than he had expected. However, Schwarzenberg had massed over 80,000 men, hidden on reverse slopes, to attack the next day. Some more French reinforcements arrived overnight, but Napoleon had only 28,000 men, including 9,000 cavalry at dawn on 21 March. F. Loraine Petre argues that if Napoleon had not ignored the reports that he faced a major opponent he could have safely moved across the Aube at night. He could then have left Macdonald behind in a defensive position, whilst threatening the Coalition lines of communication by operating along the north bank of the Aube. Tsar Alexander feared that he would do this, which would probably have forced Schwarzenberg to retreat. On the morning of 10 am Schwarzenberg delayed ordering an attack as he was uncertain of Napoleon’s strength and intentions and because the Tsar opposed a Coalition offensive. Napoleon at first continued to believe that he faced only the enemy rearguard, but waited for the arrival of Macdonald. Just after 10 am Napoleon, unaware of how many enemy troops were hidden on the reverse slopes, ordered Sébastiani and Ney to advance from Torcy-le-Grand on his left flank. They stopped on seeing the size of the Coalition army. Petre argues that a bold Coalition attack at this point ‘must have swept the French bodily into the river.’ However, Schwarzenberg did not decide to issue attack orders until after a council of war at noon, and the attack would not start until he gave the command. Napoleon acted quickly once he realised that he had been acting on false assumptions. He issued orders to retreat across the bridge at Arcis and a pontoon bridge that was to be hurriedly built at Villlette. The pontoon bridge was ready by 1:30 pm. Schwarzenberg did not attack until 3 pm, when he finally realised that the French were retreating across the river. The rearguard was commanded by Sébastiani, who got most of his cavalry across the pontoon bridge before destroying it, and Marshal Nicolas Oudinot; his outnumbered troops fought in Arcis until 6 pm, when they withdrew across the bridge and destroyed it. Over the two days the French suffered about 3,000 casualties and the Coalition 4,000. The Coalition did not try to pursue the retreating French, who reached St Dizier on 23 March. Coalition troop strengths are from D. C. B. Lieven, Russia against Napoleon: The Battle for Europe, 1807 to 1814 (London: Penguin, 2010), p. 505; French from F. L. Petre, Napoleon at Bay 1814 (London: John Lane, The Bodley Head, 1914), pp. 156-58. Quoted in Petre, Napoleon at Bay, p. 156. This phrase is used by both D. Chandler, The Campaigns of Napoleon (London: Weidenfeld & Nicolson, 1966), p. 996; and Petre, Napoleon at Bay, p. 169. Petre, Napoleon at Bay, p. 171. Petre, Napoleon at Bay, p. 172. The Battle of Rheims 13 March 1814. After his defeat at Laon on 9-10 March Napoleon was able to retreat to Soissons because of the inertia of General August von Gneisenau, who took command of the Army of Silesia after Prince Gebhardt von Blücher, its commander, was taken ill.
Napoleon remained at Soissons until he learnt that General Emmanuel de St Priest’s corps had moved to Rheims, within striking distance of Soissons, on 12 March. St Priest had been positioned at St Dizier in order to link the Army of Silesia with Prince Karl Phillip zu Schwarzenberg’s Army of Bohemia. Defeating St Priest would break the Coalition communications and threaten the Army of Silesia’s left rear and the Army of Bohemia’s right flank. Napoleon had been reinforced to 40,000 men since Laon, whilst St Priest had 12,000, a mixture of Russians and conscript Prussian Landwehr. Napoleon moved rapidly to Rheims, and launched a surprise attack on 13 March. St Priest’s Prussian Landwehr had dispersed to forage for food, and were easily beaten. The Russians put up sterner resistance, but were overwhelmed. The French inflicted 6,000 casualties and suffered only 700. St Priest was amongst the wounded , and died on 29 March. This victory boosted French confidence and caused both Coalition armies to halt their advances. Troop strengths are from D. C. B. Lieven, Russia against Napoleon: The Battle for Europe, 1807 to 1814 (London: Penguin, 2010), p. 503. Casualties are from D. Chandler, The Campaigns of Napoleon (London: Weidenfeld & Nicolson, 1966), p. 993.